The sustainable construction practices at two 2022 FIFA World Cup stadiums have been recognized as outstanding by the Global Sustainability Assessment System (GSAS). Both Al Wakrah Stadium and Al Bayt Stadium Al Khor City were awarded a Class A* rating by GSAS, which is administered in Qatar by the Gulf Organization for Research & Development (GORD). Al Wakrah Stadium will have a capacity of 40,000 and host matches up to the quarter-finals stage during Qatar 2022, while Al Bayt Stadium will be a semi-finals venue with 60,000 seats. Construction at both venues is due to be completed soon. 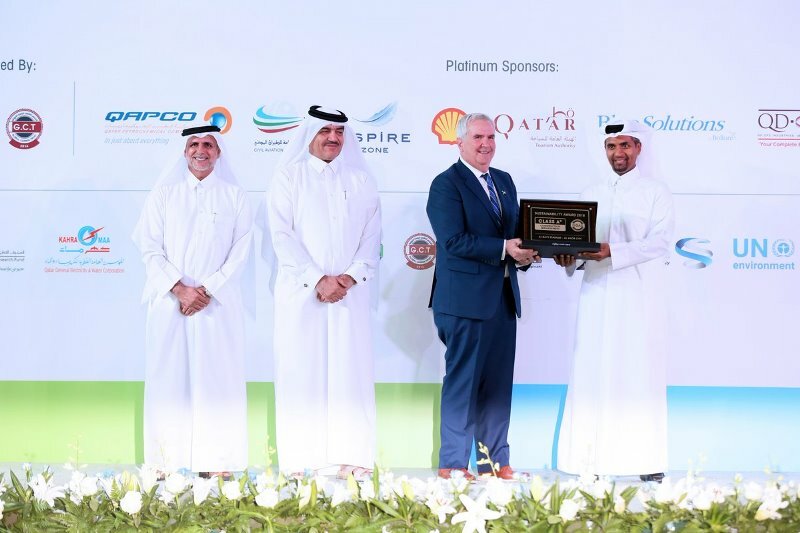 Abdulaziz Ali Al Ishaq, the Supreme Committee for Delivery & Legacy’s (SC) Al Wakrah Project Director, and Abdulaziz Al Mahmoud, Aspire Zone Foundation’s Deputy President for Sport Projects, picked up the respective awards during the Sustainability Summit 2018, which was recently hosted in Doha by GORD. Commenting on the milestone, Al Ishaq said: “Sustainability has been at the heart of our project from day one right from the design phase, all the way through to completing the construction of the stadium. Meanwhile, Dr. Nasser Al Hajri, Al Bayt Stadium Project Director at Aspire Zone Foundation, said: “We are very proud of the work done by the Al Bayt Stadium team to achieve this certification. Sustainability is at the core of our work on a daily basis. In awarding the Class A* rating, Global Sustainability Assessment System (GSAS) praised both stadiums’ promotion of sustainable practices, along with their monitoring and reduction of environmental impacts on construction activities. During development, the project teams prioritized waste recycling, the reuse of materials and water, and dust suppression. The GSAS Trust, an independent certification body, calculated the Class A* ratings after conducting four site audits during the construction process at both venues. The SC is overseeing the development of seven stadiums in preparation for the 2022 FIFA World Cup, along with the redevelopment of Khalifa International Stadium, which reopened in May 2017. Each proposed venue is mandated to achieve a four-star GSAS Design and Build Certificate, which assesses the level of sustainability within the design of the stadium building.